Claw Machine, 2018, repurposed arcade machine, soft flamingos, and replenishable tokens, H2070 x W1200 x D1160. Claw machines are commonly found outside of amusement arcades, lining the seafront with bright lights, catchy music and attractive merchandise. These machines are often placed close to the entrance, attracting passers-by with a chance to win great prizes. Often priced around £1 or under for a go, redemption machines like this offer the possibility of winning big, with little investment. In reality, these machines are programmed to require multiple attempts, a large investment of time and a continuous supply of coins arguably resulting in frustration, disappointment and a lack of faith in the whole arcade. The irony lies with those lucky enough to win a prize, to discover the merchandise inside can be purchased at a shop down the road for half the money spent on trying to win it. This machine promises great things, with slogans that advertise a chance to win combined with multiple free attempts; the machine appears to be an opportunity for anyone to get what they want. 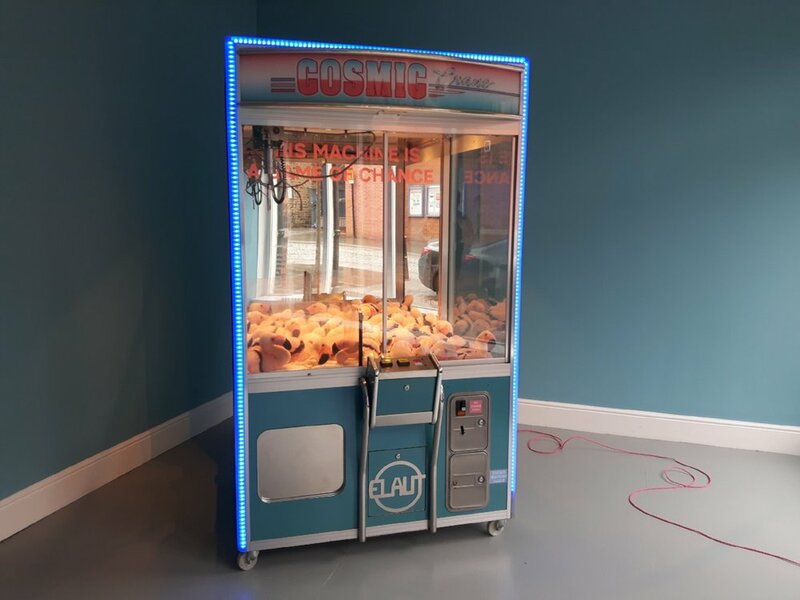 As with the seaside machines, this piece has also been manipulated to encourage a feeling of nostalgic disappoint that accompanied Fox’s childhood trips to the arcade. This promise and anticipation of getting something first time, but the disappointing reality of having to make multiple attempts, with no guarantee of when or if you might get it, is a comment of the accessibility of health care for transgender people. It also raises wider questions around freely accessible health care, underfunding of the NHS and the resulting waiting times that cause additional mental and physical strain on patients.